This particular winter’s day I received a call that “There is a penguin in difficulties off our restaurant”. In the true spirit of a wildlife carer I donned bathing togs and rushed to Little Manly Cove to the rescue. The diners on the terrace had a beautiful view of breaking sea on oyster covered rocks with penguin some distance away. What now? The thought crossed my mind to turn and go home. But no! The first rule when going on a rescue is not to be the next patient. With that in mind I eyed the dangerous sea and rocks. However, the lunch-time diners were expecting some action and putting valour before common sense I carefully jumped in. When rescuing penguins in the water I take a long-handled net which I place over my head and swim with the handle facing backwards. The diners had a good run for their money as I swam and swam. The current was ferocious and the more I swam the more I stayed in the same place. Penguin, however skimming on the surface, had much less pull from the current. A number of times we came face to face and I launched out with the net only to see him dive below only to re-surface miles away. The chase continued until I was in danger of collapse. The penguin was in much better condition than me by then so I ruined things for the lunchers and called it off. I should have gone around with a hat asking for donations, but I didn’t! One old lady who had witnessed these antics came out and offered me a cup of tea but by then I was shivering from cold so much I wouldn’t have been able to hold the cup. Penguin was never reported back so presumably he recovered from the shock of being chased by this strange lady. Another time I had the great privilege of being able to swim with the penguins in the Galapagos when we cruised there in our yacht. There was a big group of them and I swam among them as they dived like little jet-propelled rockets all around me not once taking any notice of me – just getting on with their own activities regardless, as the animals do in these magic islands. The Little Penguin is the smallest of all penguins, weighing about 1kg. 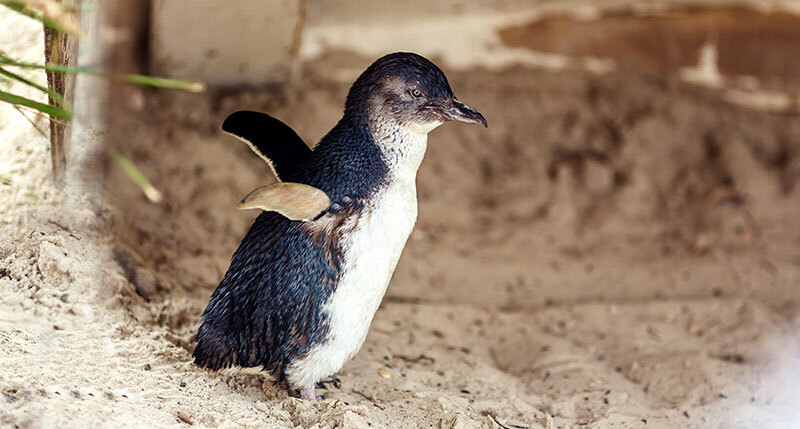 In Philip Island they found that a male little penguin left at about 5.00am and came back home at 7.10pm on the same day. He spent 42% of the time diving and had more than 400 dives in his search for food for his two hungry chicks. The maximum depth reached an amazing 47.19 metres . He dove in a straight line towards to the bottom, at 1.2 metres per second, and then started to ascend slowly, searching for food. This dive lasted for 92 seconds, which is the longest dive ever recorded. Sailing in both in Broken Bay and Sydney Harbour it is possible to see Little Penguins swimming around. They are hard to spot but their barking calls can be heard all around during the quiet times. Their main nesting areas are around Manly and on Lion Island in Pittwater. For a period of 17 days the bird replaces all its feathers. It sits still, looking sick and fluffed up. At this time it is not waterproof and must stay dry.